You Are What You Eat. Just like us, the fuel we choose to put in our pets’ bodies can pay big dividends in overall health and quality of life. However, choosing an appropriate, nutritious pet food can be downright overwhelming, due in part to the challenge of interpreting pet food labels. Armed with an understanding of what to look for on a label, you can approach that decision with confidence and select the best pet food for your buddy. So let’s turn our pet food bag over and take an educated look at the information on the back. Ingredients in pet foods are listed in descending order by weight. Look for high proportions of meat proteins and meat meals from named (lamb, turkey, salmon), not generic, sources. Animal-based protein is the most natural source of protein for dogs and cats, providing them with the essential amino acids that their bodies require. 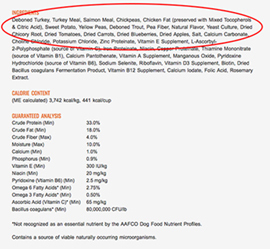 On Nulo Pet Food’s labels, you will see three, or more, single-source meat ingredients at the top of every list. Nulo’s ingredient list also contains vegetables and fruits, like chickpeas, lentils, apples and blueberries which deliver dietary fiber, vitamins, enzymes, and antioxidants. Nulo also selects low-glycemic carbohydrate sources that yield a more sustained energy source for the body and mitigate the spike in blood sugar levels associated with higher glycemic index ingredients. In general, avoid pet foods that contain high glycemic ingredients like white potatoes and tapioca, generic animal by-products and fats, added sweeteners, artificial colors and flavors, and artificial preservatives. As a consumer, it is important to know the carbohydrate content when you are comparing pet foods. Dog and cats do not have a dietary requirement for carbohydrates and consuming them in excess can cause weight gain and other related health issues. However, current regulations do not permit carbohydrate contents to be listed on pet food labels. With the following formula, you personally can calculate the amount of carbohydrates found in your dry pet food by using the values displayed in the Guaranteed Analysis: 100% – (Crude Protein %) – (Crude Fat %) – (Moisture %) – 8.5% (for average Ash level). Look for foods with calculated values around 35% for dogs, and 25% for cats, or lower. Calorie content in pet foods is expressed as “kilocalories per kilogram” (kcal/kg). A kcal is equivalent to the Calorie that we are accustomed to reading on our own food labels, while a kilogram is equal to 2.2 pounds. The calorie statement also lists calories in familiar household units such as kcal/can or kcal/cup. The Guaranteed Analysis (GA) section indicates the minimum percentages of crude protein and fat in the diet, as well as the maximum percentages of crude fiber and moisture. In Nulo’s GA section, you will find listed, among other nutrients, omega fatty acids 6 and 3 in the appropriate ratio, as well as Bacillus coagulans, a probiotic to promote your pets’ natural bacterial flora balance. The patented probiotic BC30 survives the cooking process and is present in all of Nulo’s products. Feeding guidelines are recommendations for how much a pet should be offered on a daily basis, typically based on the pet’s weight in pounds. It’s important to remember that each of our pets varies greatly in his or her daily caloric/energy requirements based on age, life stage, activity level, environment, breed, and general health. 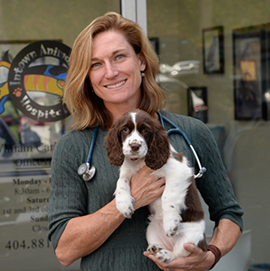 Your veterinarian is an excellent resource in helping you determine an appropriate daily caloric intake for your pet’s unique needs. What we find here is the most important aspect of a pet food label – an affirmation that the product is “complete” (it contains all the nutrients required) and “balanced” (the nutrients are present in the correct ratios). The “AAFCO Statement” is also the key to matching your pet’s nutritional needs with the most appropriate diet for their life stage (gestation/lactation; growth; or maintenance). As a pet mom and a veterinarian, what I want in a food for my 4-legged kiddos is a diet that is nutritionally balanced based on science not hype, carefully formulated for optimal delivery of nutrients, transparent in its caloric content as well as its list of ingredients and sources, and is enjoyed by my pets. With a better understanding of how to interpret a pet food label, I know you can make an intelligent, informed decision about the food you place in their bowl. Healthier Together! Another excellent source of trusted pet food label information can be found on the FDA’s website.